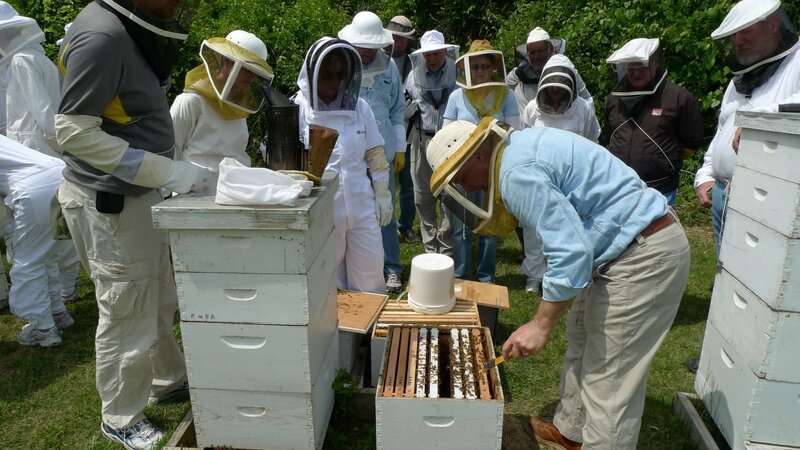 Beekeeping association educational apiaries – a good idea! Posted on May 6, 2012 | Comments Off on Beekeeping association educational apiaries – a good idea! While in St. Louis last week, I visited the educational apiary of the Eastern Missouri Beekeepers Association (EMBA) with my friend Bob Sears, who is president of the association and was involved in establishing their apiary several years ago. Along with beekeeping classes, schools, and mentoring programs, association apiaries are, I’m convinced, an invaluable service that beekeeping associations can offer their members. The Eastern Missouri beekeepers have developed an integrated educational program for new beekeepers, comprised of all of the programs I listed above. The association apiary is key to offering hands on instruction to the members, especially newer ones. While it is possible to use members’ hives and apiaries in beekeeper education (as many groups do through Saturday afternoon field days), logically and educationally, it is far better to have a bee yard that is dedicated to education and is owned and maintained by the association. 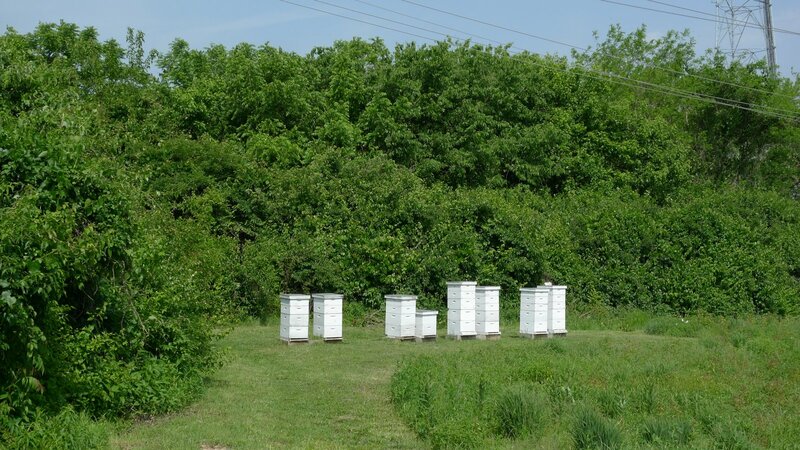 Scheduling issues are minimized, the progress of individual hives can be followed, and even hives with problems can be turned into positive teaching tools in an association owned apiary. Establishing your association apiary may not be as difficult as you think. The major obstacle is locating and obtaining use of a site. Private sites can work and are often the most easily obtained, but issues of security, regular access, liability, and minimizing inconvenience to the property owner make them problematic. With publicly owned sites, such as a nature center or university agricultural station, these issues are more easily resolved, and the apiary can serve as an educational tool to the public as well. The EMBA apiary is located at the Donald Danforth Plant Science Center, an agricultural non-profit research facility located near downtown St. Louis. Bob Sears found the location by literally driving around St. Louis and looking for possible apiary sites. After locating the empty lot, he inquired among members of his group if anyone had a contact at the Danforth Center. Someone did, and use of the site was obtained. Besides finding a site, the other requirement for an association apiary is participation by the group’s members. Working to locate the site, setting it up, obtaining and maintaining the hives, and staffing the educational sessions require time. Some of the work can be part of educational programs, but some is just work, so volunteers dedicated to the program are essential. 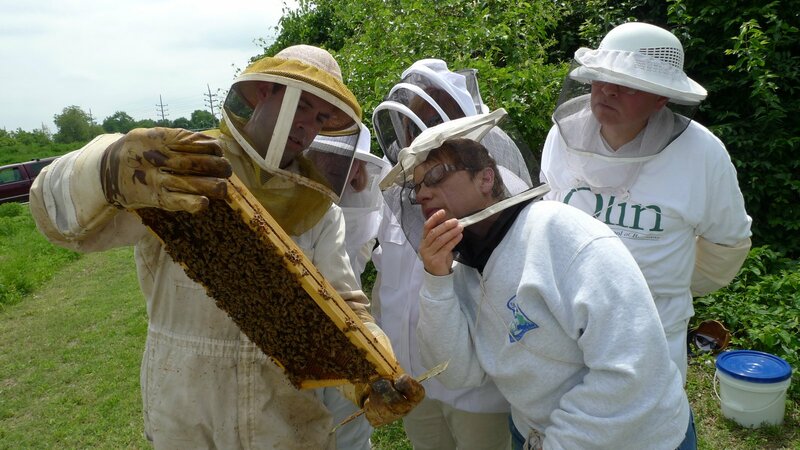 If your association is active in providing hands on beekeeper education to your members or is interested in doing so, consider establishing your own educational apiary. It’s a good idea!